If you’ve used a serger before, you already know what a time saver it is. It can trim and finish and edge and sew a seam all at the same time. 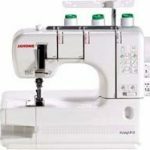 Let’s take a closer look at these two 3 and 4 thread convertible sergers from Janome and Brother to see which will be the best one for you. 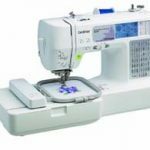 If you’re new to serging, you may find the Janome 8002D very easy to use. You’ve probably heard the horror stories about having to use tweezers to thread them. In the case of the 8002D, users have commented that this is usually not necessary. First, open the looper door on the front. You’ll see a quick reference color-coded guide to help you thread the machine without breaking a sweat. The tension dials are also color coded to help you along the way. 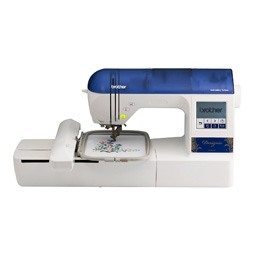 Besides the easy setup, the 8002D has a seam guide, an upper retractable blade for trimming edges, adjustable stitch length and width, differential feed, thread cutter, and a rolled hem changeover device. The stitches adjust between 1 and 4mm in size. You can trim edges between 3.1 and 7.3mm in thickness. When you being sewing with it, you’ll notice that the machine, while a little noisy, has almost no vibration. It lays down tight, neat stitches with speeds up to a blazing fast 1300 stitches per minute. It comes with a foot controller with adjustable pressure. There is only one kind of needle you can use with the 8002D and that’s the HA-SIP #11-14 kind. You can sew denim, cotton, linen, knits like wool, silks, and synthetics without a hiccup. The 8002D cannot handle leather, canvas, or multiple layers. It also does not have a free arm design to enable you to sew cuffs and collars easily. 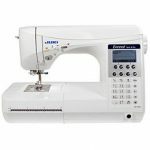 The Janome 8002D would be a great beginner’s serger for anyone who has some sewing experience. What it does, it does very well. 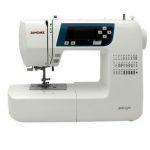 The Brother 1034D is another great serger for people who love to sew but don’t have much (or any) experience with sergers or overlock machines. It’s very handy for sewing decorative edges like ruffles and making garments and household decorations with linen and knits. 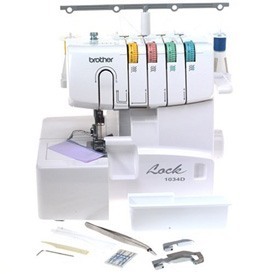 Like the Janome 8002D, the Brother 1034D is a 3 and 4 thread convertible machine. It can make rolled hems as well as many other stitch functions that you would use on heirloom clothing projects and more like ribbon lock and narrow hems. If you purchase additional presser feet, you can also perform pin tucks, blind hem stitches, and flat lock stitching. When you prepare to use the machine, it’s not super hard to thread or to set the tension because it has a color-coded guide to follow. The knife blade is retractable so you don’t have to trim edges if you don’t want to use that feature. And of course, you can choose between using three or four threads depending on your project. 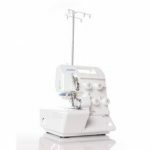 It sews up to 1300 stitches per minute just like the Janome. The different feed keeps the stitches neat and even on stretchy fabics. If you want to sew a collar or hem a cuff, the Brother 1034D has a removable free arm, something the Janome does not. And the stitch width is larger (5mm to 7mm) than that on the other machine. 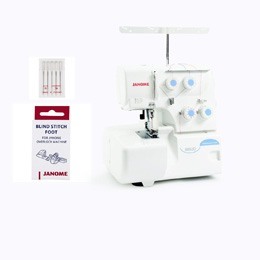 Both the Janome 8002D and the Brother 1034D are easy-to-user sergers that are good for beginners. They are easy to set up and use. They are not made for sewing thick fabrics or multiple layers, but they are excellent to use on knits and stretchy fabrics. They are a real time saver on projects where you need to finish the edge as well as hem. The Brother 1034D has a few more advanced features than the Janome 8002D. It comes with a removable free arm, which is a valuable bonus for serging sleeves. The stitches it lays down are larger than the Janome offers and it uses regular sewing needles. If you don’t need a free arm, you may be pleased with the Janome 8002D. If you need tinier stitches, this is also the machine for you. 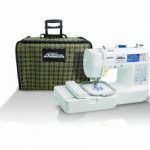 Click here to purchase Janome 8002D on Amazon.com!